US $159.99 For Sale! Contact us for price. ☺ Ultra-thin, White radome, RoHS Compliant. ☺ Compact design and high efficiency with Plenum Rated pig-tail cable. ☺ Covers cellular bands and WiFi from 608 through 2700 MHZ. ☺ An indoor ceiling-mount omni-directional antenna with up to +6 dBi Gain. ☺ Works with all 50 Ohm amplifiers and related parts, accessories. ☻ Adding flat dome antenna(s) to your existing cellular amplifier kit? 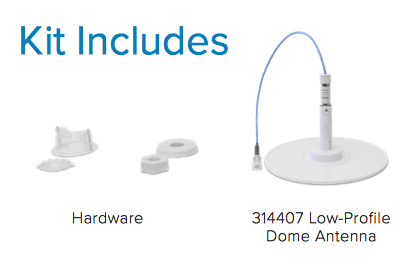 Consider following 50 Ohm dome flat antenna expansion kits that include parts you will need to connect to your existing cell phone signal booster kit. ① One 50 Ohm Flat Dome Antenna Expansion Kit. ② Two 50 Ohm Flat Dome Antennas Expansion Kit. ③ Three 50 Ohm Flat Dome Antennae Expansion Kit. Product description of 3G 4G LTE Low Profile Dome Antenna (50 Ohm, Flat, Thin, Indoor, Ceiling). 3G 4G LTE Flat Dome Antenna (50 Ohm) with SKU Wilson Pro / weBoost 314407 is a Low Profile Dome Antenna with Hard Ceiling Mount and 10 inches RG58 Plenum cable with N-Female connector. It broadcasts in an omni-directional fashion. It operates on 50 Ohm impedance so it can be used with any cellular signal amplifier with 50 Ohm impedance output port. This flat & thin antenna is ideal for indoor ceiling mounting to broadcast signal downward in 360 degrees. Therefore, it is perfect for mounting on ceiling in a central location. Please note that this purchase does not include the optional reflector which improves broadcast signals slightly by reflecting lost signals back downwards for even more reception enhancement. If required, this same slim antenna WITH reflector can be purchased at an additional cost. This 2G, 3G, 4G, WLAN Indoor 50 Ohm Low Profile Flat Circular Ceiling Antenna (WilsonPro 314407) without Reflector provides Gain of 4 - 6 dBi on frequencies ranging from 608 MHz to 2700 MHz. It has a N-Female connector. Quick Summary of weBoost / Wilson Pro 314407 Dome Antenna (Slim). Covers cellular bands and WiFi from 608 MHz through 2700 MHZ. Omni-Directional dome antenna is very popular and high performing inside building antenna system because it features an elegant design which is stylish enough to blend into any type of decor. It is compact and low profile. As most of our building interior dome antennas, it features wideband frequency range from 608MHz to 2700MHz boosting signals on a 50 ohm system to cover 2G/ 3G/ 4G and WLAN systems for Cellular, PCS, AWS and LTE frequencies. Its installation is easy and multi-band antenna boasts coverage for all Carriers in USA and Canada including the latest 4G LTE+ / LTE-A and AWS frequency bands. It features vertical polarization and a maximum of 6 decibels gain. It features N-Female connector at the base that can be used with standard 50 Ohm cables. It is made to distribute signals in all directions, and from practically all cellular service providers regardless of whether 2G, 3G, 4G, or LTE and even W-LAN. The mounting hardware included enables antenna to be placed on any ceiling thereby improving the signal in all directions along its radius. This interior omni-directional antenna is a popular choice for installation indoors. It is compatible with 50 ohm amplifiers and accessories. It broadcasts signal in all directions and therefore, it does not need to be pointed toward any particular direction. Simple installation instructions are included with purchase. This 5 band 4G LTE antenna is an Omni-directional antenna. It is specifically designed for 360° coverage. It boosts signals of WLAN and 2G, 3G and 4G systems for Cellular, AWS, PCS, and LTE frequencies stated. This is a high-gain indoor antenna. It is designed for areas where the signal is to be broadcast over a central space or area. It is this ceiling-mount antenna that receives signals from a signal amplifier. This antenna then transmits signals to cell phones and similar cellular devices such as tablets and mobile hotspots with service from all service carriers and providers in USA & Canada.